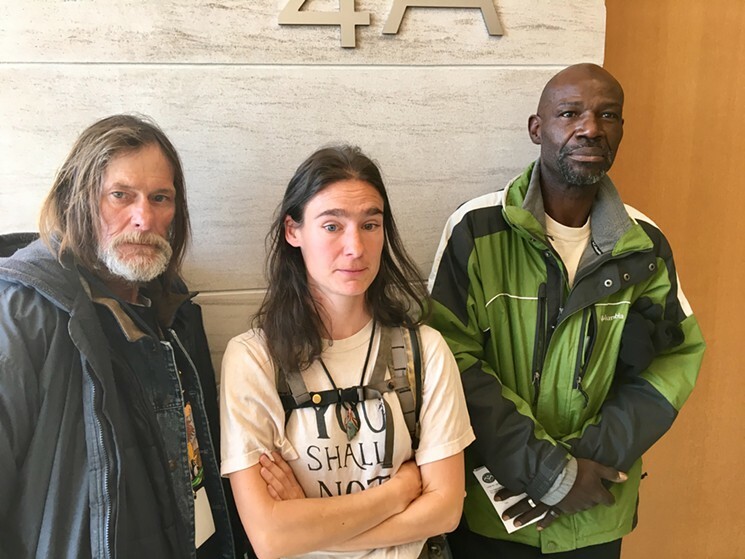 On April 4th, 2017 at 8am the Lindsay Flanigan Courthouse Jerry Burton, Terese Howard and Randy Russell will be the first people in Denver to ever take an unauthorized camping ban ticket (more accurately named “survival ban”) to trial. These three co-defendants, victims to this cruel, arbitrary, and unconstitutional law, are just three of the hundreds of homeless people who are victim to this law every day as police drive around telling homeless people covered with blankets to “move along.” Between the three co-defendants, they have five “survival ban” tickets, all from November 28th. These tickets were given to them for using blankets or tents to survive as they all had done hundreds of times before and continued to do afterward as anyone must to survive outside without a home. The law makes it illegal for a person to “use any form of protection from the elements other than one’s clothing” anywhere in the city of Denver. The Denver government is spending massive resources to prosecute Burton, Howard, and Russell, including calling 33 Police Officers as witnesses in the trial. According to the law, the co-defendants are facing up to $999 and a year in jail for the crime of using blankets to try to stay warm on a cold winter night. Buron and Russell both had their blankets, sleeping bags and tents taken “as evidence” of the crime of camping – leaving them with no gear to survive the freezing winter night and driving Burton to the hospital. Shortly after this, Mayor Hancock publicly directed the Police Department to cease confiscating survival gear for the safety of homeless people sleeping on winter nights. Yet the government is still prosecuting these individuals. The government has tried to make these co-defendants’ cases out to be rare and a response to a protest. These are lies. While the government has avoided giving “survival ban” tickets (likely to avoid trials like this which put the unconstitutionality of the law at question and take massive taxpayer resources), 24 people have been ticketed for the ban and thousands have been forced to move along and had belongings taken. Burton and Russell were first ticketed on November 28th 2016 at 27th and Arapahoe where they had been surviving for months. After hundreds of homeless people, including Burton and Russell, had been forced to move from the areas they had found to gather for safety and protection, they, along with about 20 other homeless people who had been displaced that day, moved to city hall where they hoped to be allowed to sleep. This was not a protest – this was survival. Burton, Howard, and Russell have pleaded not guilty and will be bringing their cases together as a joint trial, represented by attorney Jason Flores-Williams. As the government, under the direction of Mayor Hancock, uses our tax dollars to prosecute these cases of public survival while homeless, we will continue to stand up in the courts, city council, state capitol, and on the streets to bring this injustice to an end. Come witness this monumental trial starting April 4th at 8am – 5pm and likely continuing on April 5th and 6th.